Founded in 1883 in Geneva, Switzerland, Alpina is a family-owned fine watchmaking manufacture, known for its red triangle signature. Alpina announced the Seastrong Diver 300 Chronograph Big Date diving watch. 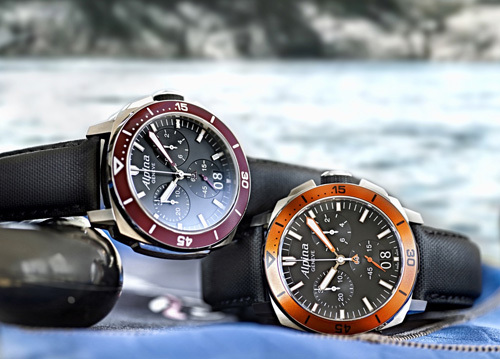 Alpina diving watches have long been popular, starting back in the 1960’s. Back then the popular Seastrong “10” diving watch allowed divers to go down to depths of 200m or 660ft. The new Seastrong Diver 300 Chronograph Big Date watch is a top, readable professional diving chronograph range. The watch is water-resistant, down to 300m or 1000ft. The Seastrong Diver 300 Chronograph Big Date by Alpna has unique, colored unidirectional turning diving bezels. In addition the diving watch’s oversized minute hand is perfect for optimum, diving time readability. The Extreme Diver 300 watch was carefully designed to include all of the necessary features allowing watch owners to obtain the important information they require. The goal is to provide valuable info when a diver needs it and help them enjoy a safe dive. The new Alpina watch features an aluminum, unidirectional, turning bezel that turns in only a anti-clockwise direction. Therefore the number of elapsed minutes can only be increased and never accidentally decreased. The Alpina Seastrong Diver 300 Chronograph Big Date watch utilizes the AL-372 Swiss High Precision Quartz Chronograph movement. This movement is incredibly precise and reliable to 1/10th of second. The watch features a Swiss quartz chronograph movement with 30 and 10 hour chronograph counters. In addition, the watch comes with a standard battery life of 48 months, plus both add and split functions and a big date display. On the bezel are 60 minutes markers which are luminous,. The dial indexes are also luminous which makes a great contrast versus the watch dial’s matte black finish. The hands of the Alpina diving watch are luminous as well, This allows maximum readability even in very low visibility conditions. The watch also comes with an over-sized minute hand so you can safely read the important diving time. The Seastrong Diver 300 Chronograph Big Date is perfect for divers and the new watch from Alpina comes in four different models and each with a different color of bezel – grey, bordeaux, orange and navy blue. If you would like to purchase the new Seastrong Diver 300 Chronograph Big Date diving watch from Alpina, contact us today. Follow this luxury blog to read about other luxury watch releases and the latest news in the watch industry. ← The Jefferson Hotel – Summer Fun in Washington D.C.